When pre-K teachers at community centers typically make $27,000 less than public elementary-school teachers, how can we expect quality early-childhood education? Universal preschool is the next big thing in public education—or at least, in the politics of education. Hailed as a great equalizer by children’s advocates and championed as a bipartisan line item for conservatives and liberals. The only problem is that universal pre-K isn’t very universal in the communities that need it most. The latest data crunch of the National Institute for Early Education Research (NIEER) suggests that while universal pre-Kindergarten holds enormous promise, programs in many cities and states suffer from inconsistent funding, uneven standards and failure to develop workforces to meet widening social needs. States are nonetheless getting more universal in terms of promoting uniform early-education standards: Nationwide, benchmarks for preschool programs have intensified, with more programs requiring, for example, that pre-K teachers have at least 15 hours of in-service training and a bachelor’s degree. But in some states like Texas and Pennsylvania, programs have failed to set parameters for decent class size and staff-student ratio standards. Reflecting the tension between access and quality, the pattern suggests that classes may grow at a rate that outpaces the growth and improvement of the teaching workforce. The federal government can play a major part in shifting the country toward a universal preschool infrastructure. Many programs have been boosted by the White House’s Preschool Development Grant program. But again, year-to-year grants come on a piecemeal basis, which won’t resolve generational challenges to systemically overhauling early education programs. The research on early childhood development shows that, as a social investment, preschool is associated with long-term cognitive gains and saves states money down the line by reducing academic problems like grade repetition and special-education placement. But the early-childhood premium attached to precious young ones is hardly reflected in the treatment of early-childhood educators, which in turn undermines preschool’s potential as a social equalizer. 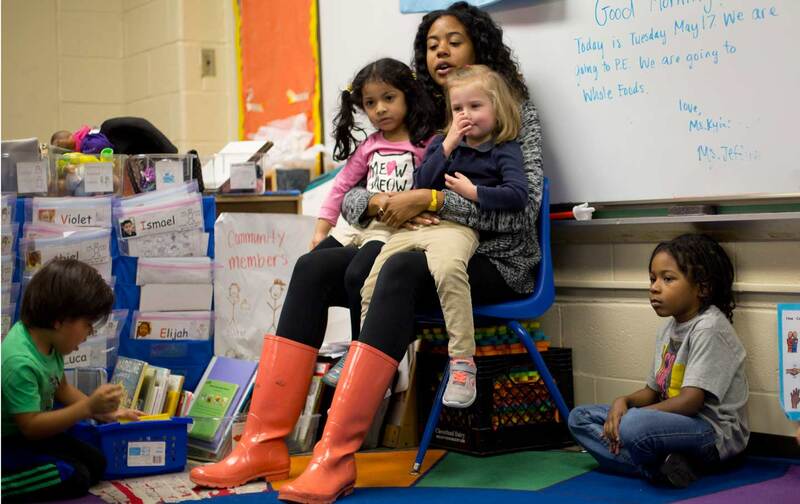 Overall, preschool teachers lack the stable career path provided to their K-12 counterparts. NIEER’s survey shows that most state education agencies lack on-the-job professional development opportunities, and most fail to offer scholarships or loan forgiveness to encourage specialized higher education for staff—the kind of continuing education that’s crucial for strengthening much-needed racial and ethnic diversity and economic inclusion in the early-childhood educational workforce. The risk is that a tremendous amount of time and energy goes into planning, coordinating, aligning, etc. while there is little access and quality is very low. Sometimes I think the field wants to put all of [its] time and energy into systems building when the fundamental problem is inadequate programs. There’s broad consensus that universal pre-K is a universally good thing, but that attractive policy proposal rings hollow if not met with wise educational-budget priorities. To the extent that the policy helps narrow inequality in early childhood, it should also promote a similar social rebalancing in the educational profession, lest both teachers and children get left behind.